Gov. Bill Richardson admitted early on in his free-wheeling lecture to students at the University of New Mexico that it was his idea to talk to them about U.S.-Cuba relations. “I actually organized this talk,” the ex-United Nations ambassador fessed up. But did that admission mean that Richardson is eager to resume a leading role in international affairs — specifically, Latin American affairs? If it did, Richardson only helped the cause. During the course of the Tuesday afternoon lecture, the nation’s only Latino governor outlined a "sequential" diplomatic push to eventually normalize relations between the United States and the socialist Caribbean country. Part of the Richardson push — as reported by NMI’s Marjorie Childress earlier today — included making a strong case that all Americans should be allowed to travel to Cuba and that the trade embargo should be lifted. Back in April, it was first reported that the Obama administration would allow Cuban Americans unlimited visits and remittances to family on the island. Richardson noted that the new policy took effect only last week. While Richardson didn’t get that particular wish, he did make his views clear, beginning with U.S. interests. 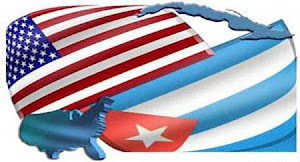 From our side, what we want is release of Cuban political prisoners, some kind of democratization process, (and) freedom of travel of Cubans coming to the United States . Later, as he shifted to ticking off a list of what he thinks the U.S. government should do, Richardson appeared to be negotiating with himself. Above all, the Richardson lecture regaled students with stories to make the lesson sharper. “We want Cuba to be more democratic. I mean, it is not democratic. You know, Cuban officials win by 98 percent. That’s not democratic. And I remember arguing with Fidel Castro, saying ‘You know, you did pretty well in that last election. What happened to the 2 percent? Were they still around?’ He didn’t think that was funny,” Richardson deadpanned, referring to his successful 1996 effort to release three political prisoners in Cuba . Even Richardson ’s secretary of the state Department of Cultural Affairs, Stuart Ashman, got into the story-telling act as the governor’s teaching assistant for the day. Ashman, born and raised in Cuba , was invited to the podium by Richardson . He promptly put last week’s newly-implemented policy on travel and remittances in plain language — and tipped his hat to his boss’s most recent trip to Cuba last month where Richardson announced his willingness to facilitate a new dialogue between Cuban Americans and Cuban officials. While Richardson voiced his support for the new travel policy, he made it equally clear that he believes the ball is now in the Cuban government’s court. One Cuban American member of the audience — retired UNM professor Nelson Valdes – praised Richardson for having the courage to be what he called a diálogero. “For some Cuban Americans in south Florida ,” Valdes explained, “the term diálogo is a pejorative. It has a negative connotation. The worst thing you can be called in Miami is diálogero. That’s worse than hijo de puta,” he said colorfully. Valdes later suggested that Richardson host a dialogue among Cuban Americans — of all idealogical stripes — in New Mexico to discuss greater engagement. “To see what we come up with,” he said. As the lecture winded down with a few more student questions, it wasn’t too hard to picture Richardson leading such a dialogue, despite the harsh criticims expressed from more conservative elements of the Cuban exile community when he first mentioned the proposal last month. But Richardson clearly has his fans, beyond the students who squeezed into the lecture hall at UNM’s Dane Smith Hall Tuesday afternoon. In fact, Washington Note blogger Steve Clemons gave President Obama some free advise last month that I imagine went over fairly well at Santa Fe ’s One Mansion Drive . Obama should ask Bill Richardson to be his envoy, sherpa and nudge to drive US-Cuba relations beyond the anachronistic Cold War trap they have been in towards new terms of engagement fit for the 21st century and Obama’s eventual foreign policy legacy.